Hill Crest, completed in 1912, was built by successful local meat and produce businessman, Adam Oscar Surber. In the 1920s, Hill Crest was sold to Dr. John M. Emmett, Chief of Surgery at the C&O Railway Hospital. Dr. Emmett extensively remodeled the home in 1935, adding two wings on the sides and rear of the home, as well as a three-bay carriage house with apartment, and acres of formal English gardens. Hill Crest is a two-story home on 2.82 acres. 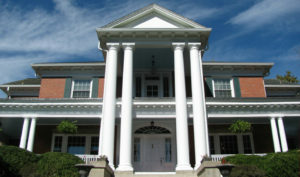 Featuring stunning Greek Revival architecture, Hill Crest has four massive 20-foot columns supporting a classic portico with brilliant white trim contrasting against red brick. Situated at the top of the city’s most prestigious street, Hill Crest’s 64-foot wraparound porch offers a commanding view of the city and the surrounding mountains. Hill Crest has 24 rooms on 4 levels, and approximately 5,800 square feet of finished living space. Hill Crest also features a 40,000-gallon in-ground pool, beautiful gardens, stone retaining walls from the 1900s, majestic trees for privacy and intimacy, and 100-year-old English boxwoods.